Lovely large teapot. 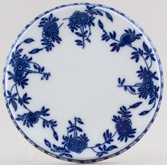 Backstamp: Adams Member of the Wedgwood Group Real English Ironstone Micratex Est 1657 England Blue Butterfly Decoration completely underglaze Acid and detergent proof. There is a tiny manufacturing chip under the spout which has been glazed over otherwise excellent condition. Lovely hexagonal pot. There are a couple of small manufacturing faults to the base of the handle otherwise excellent condition. Lovely rural scene surrounded by a pretty floral border on this stand. Backstamp: Adams W A Co Est 1657 Cattle Scenery Ironstone. Light all over crazing and a little minor surface scratching with just a little wear to the outer rim. Fabulous ovoid teapot with flower finial to the cover. Backstamp:Adams Est 1657 Cattle Scenery England and impressed Adams Tunstall. There is a little wear and tiny tiny hairline to the rim of the spout and minor wear to the inner rim of the lid otherwise excellent condition. One of those elusive little pieces! In excellent condition. Lovely ovoid pot with moulded detail to the cover. Backstamp: Backstamp: Rd No. 623294 This Pattern was introduced by William Adams in 1780 being a copy of a Chinese pattern & one of the first of its style produced in English Pottery Wm Adams and impressed Adams Tunstall. Lovely small ovoid teapot with different pattern cartouche either side of the body. Backstamp: Rd No. 623294 This Pattern was introduced by William Adams in 1780 being a copy of a Chinese pattern & one of the first of its style produced in English Pottery Wm Adams and impressed Adams. There is a little minor smudging of the pattern to the handle and spout and two tiny stains inside the spout, overall excellent condition. This is a fabulous piece. Backstamp: Rd No. 623294 This Pattern was introduced by William Adams in 1780 being a copy of a Chinese pattern & one of the first of its style produced in English Pottery Wm Adams. A little minor wear to the inner rim otherwise excellent condition. A delightful ovoid teapot with pretty flower finial to the cover. Backstamp: Rd No. 623294 This Pattern was introduced by William Adams in 1780 being a copy of a Chinese pattern & one of the first of its style produced in English Pottery Wm Adams. Pot is printed in a slightly softer blue than the cover otherwise excellent condition. A really lovely shape of pot. Sadly there is a small hairline inside by the handle join and a little staining to the base. Also the finial tot he lid has been restuck. Superb piece for display. Pretty bulbous shape of pot. tiny mark to the top of the spout otherwise excellent. Blue printed backstamp. Lovely teapot with cattle, sheep and horse in a rural setting. 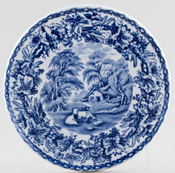 Backstamp: Adams Member of the Wedgwood Group Est 1657 Real English Ironstone Micratex England English Scenic. A little very minor discolouration inside otherwise excellent condition. Large pot holding 2 pints. This is the earlier version with cows rather than horses. Fabulous large teapot. Backstamp: Juliet Adams Est 1657 England. A little minor wear to the foot otherwise excellent condition. Lovely romantic scene either side of the pot, to the lid and even to the base of the spout! Backstamp: Landscape Adams Est 1657 England. There are a few minor signs of wear mainly to the inner rim, but overall excellent condition. We do not often see coffee pots in Landscape. This one is overall in good condition. There are a few minor signs of wear around the inside rim, but these are not noticeable when the lid is in situ'. Fabulous large pot. Backstamp: Waranted Staffordshire W A & Co Ltd England. Bone China with gilt. 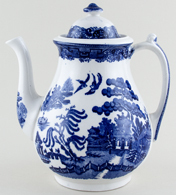 This very pretty pattern is Adderleys version of Delft. Backstamp: Brugge Made in England Adderleys (a little distorted). A little minor surface scratching otherwise excellent condition. Fabulous large pot with lovely flower detail along the line of the handle. Backstamp: Broseley Adderleys Ltd England. There is a small chip to the inner rim of the cover. The pot has a little wear to the rim of the spout otherwise excellent condition. Backstamp: Old Willow Adderley Ware Made in England. Lovely small pot with lovely printed detail to the spout and handle. Backstamp: Old Willow Adderley Ware Made in England. Fabulous pot printed in a rich dark blue. Backstamp: Allertons Ltd Est 1831 England Willow Made in England. Crazed with a little minor discolouration and a couple of small manufacturing faults to the spout, otherwise absolutely fine and a delightful piece. Square stand on four small bun feet. Backstamp: Ashworth Bros Hanley. Crazed with a little minor surface scratching and a small very minor manufacturing fault to the side, overall excellent condition. A wonderful shape of teapot, rectangular with concave corners! It is crazed with some associated discolouration inside but as a display piece superb. This is a gorgeous little coffee pot decorated with a pretty floral design. An amended version of this design was produced later by Masons and called Bow Bells. Blue printed backstamp Ashworth Bros over crown, with Hanley in ribbon. Registered number 659401 for 1918. It is crazed and the print on the pot is much softer than on the cover, but an absolutely lovely piece. Unusual shape teapot decorated with a pretty floral design. An amended version of this design was produced later by Masons and called Bow Bells. Blue printed backstamp Ashworth Bros over crown, with Hanley in ribbon. Registered number 659401 for 1918. It may have been the shape that was registered. In superb condition. Barker Bros, Royal Tudor Ware. Large coffee pot with lovely rural scene either side of the body and lovely floral detail along the line of the spout, the handle and around the cover. Excellent condition. Barker Bros, Royal Tudor Ware. An extremely elegant pot with lovely rural scene either side of the body and pretty floral detail to the spout, around the cover and along the line of the handle. Bone china with gilt rim. Small oval teapot in excellent condition. Blue printed backstamp of grapes and vine leaf with Birks Rawlins & Co, Stoke on Trent in circle with crown over. With gilt. Fabulous teapot with stand, the pot with a wavy rim and ornate handle. Backstamp: Dragon Bishop England. Underneath the stand there is a very small manufacturing chip which has been glazed over. The pot has a few very minor minor manufacturing blemishes and a little very minor discolouration inside, and the inside rim of the cover has a little wear, overall both in excellent condition. This is the lid from the 1930s ovoid 1.5 pint pot. No backstamp. Crazed with a little minor discolouration to the inside rim and the tip of the finial is a little rubbed. Lovely stand printed in a light steely blue. Backstamp: British Scenery Booths Silicon China Made in England and impressed Booths and date for 192? Light all over crazing with just a little minor surface scratching and a little minor wear under the rim. 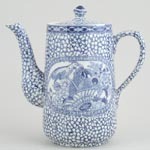 This is a gorgeous ovoid teapot printed in a steely blue with delightful rural scenes either side of the body and to the cover. 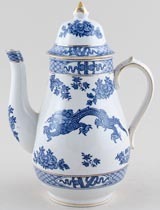 There is a little discolouration inside the spout, otherwise it appears to be immaculate, however, there is an invisible hairline at the base of the spout where it joins the pot. This leaks if the pot is used! Lovely pot in excellent condition. This is a delight! A small ovoid teapot printed in a soft light steely blue. Backstamp: British Scenery Booths Silicon China England. Light crazing with just a little minor discolouration inside, overall excellent condition. Lovely large pot printed in a steely blue with a lovely rural scene either side of the body. Excellent condition. 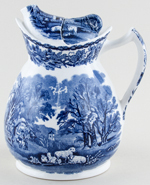 Gorgeous little coffee pot with the same rural scene either side of the body printed in a steely blue. Backstamp: British Scenery Booths Silicon China England. Light crazing, with a little minor wear to the rim and inside a little minor discolouration. Wonderful pot with lovely rural scene either side of the body and to the cover and all printed in a steely blue. Backstamp: British Scenery Booths Silicon China Made in England. Some brown mottling inside otherwise excellent condition. Large pot with virtually no signs of use, just a very small under rim chip to the finial of the cover. 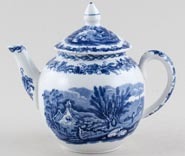 An unusual shape of teapot made to a patented design registered by Abram Allware Ltd. Apart from the shape of the pot, the novel features appear to be the fixing of the lid on the pot and the design of the gate, which is integral to the lid. The lovely rural scene is printed in a steely blue. No backstamp. Excellent condition. Lovely silver shape teapot in excellent condition. 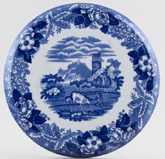 This is a fabulous shape of pot with a gorgeous rural scene printed in a steely blue. There is a small chip to the inside rim of the cover (not noticeable when cover in situ') otherwise in excellent condition. Blue printed Booths backstamp British Scenery, Silicon China Made in England. With gilt. Backstamp: Booths Silicon China Made in England. and in gilt Patt. No 9780. Light crazing and some wear to the gilt otherwise excellent condition. With gilt and printed in a steely blue. Backstamp: Booths Silicon China Made in England and black printed Patt. No 9780. Crazed otherwise excellent condition. With gilt. A little minor wear around the inner rim, not noticeable when cover is in place, otherwise absolutely fine with gilt beautifully intact. With gilt. A gorgeous small teapot printed in a light steely blue. Backstamp: Booths Silicon China Made in England and in script 9780 70. Light all over crazing otherwise excellent condition. With gilt. This unusual pot has tapering cylindrical sides and a vented "dripless" spout. 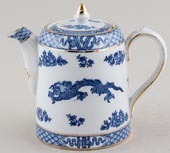 Backstamp: The Perfecta Tea or Coffee Pot with Camel Patent Drip-less Spout Patent No 234698 Booths Silicon China Made in England. The pot has a little minor wear to the gilt, a small minor firing fault to the inner rim and a tiny tiny nick underneath, overall excellent condition. With gilt. Lovely silver shape teapot printed in a light steely blue. Backstamp: Booths Silicon China Made in England and black printed Patt No 9780. There is a little wear to the gilt mainly on the handle and a little very minor discolouration inside, overall excellent condition. With gilt. Lovely shape of pot printed in light steely blue. Backstamp: Booths Silicon China Made in England and in script 9780. The occasional very minor blemish, overall excellent condition. With gilt. A fabulous ovoid pot with teardrop finial to the cover. Backstamp: Booths Silicon China Made in England. There is a little wear underneath, to the tip of the finial and to the gilt. Overall excellent condition. An early piece in Dragon, a globe shape teapot of lovely proportions. Blue printed with gilt decoration. The condition is excellent. There is a tiny stress line on the rim of the spout and another in the glaze which runs round part of the neck of the pot, both these would have happened during firing in manufacture. There is slight wear to the handle and a rub to the gilt on the neck of the pot. Bright and clean. A wonderful display piece. With gilt. Elegant pot with gently moulded body. Backstamp: Booths Made in England A8042 Floradora. There is a small chip to the inside rim of the cover, not noticeable when in situ', otherwise excellent condition.